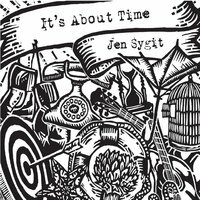 Jen Sygit is a Lansing based singer/songwriter/multi-instrumentalist releasing her fourth studio album “It’s About Time” October 2018. Previous awards/nominations include: Album of the Year (Bommarito WQKL Ann Arbor, MI), (Progressive Torch & Twang WDBM Lansing, MI); Best Folk Album nominations (WYCE Grand Rapids, MI), (Detroit Music Awards). Jen is a founding member of female string-band Stella!, roots rock band Lincoln County Process and is a veteran session vocalist having recorded on nearly 50 albums nationwide. In addition to touring, Jen hosts the weekly radio show "Eclecticana" (WLNZ Lansing, MI) and has hosted a popular open mic in Lansing since 2003.